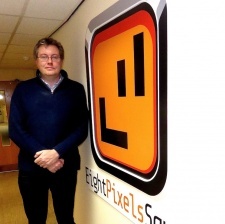 This time we spoke with Eight Pixels Square co-founder and vice president Hugh Binns. Hugh Binns: I’m a co-founder of Eight Pixels Square, currently serving as vice president (commercial). Alongside another founder of the studio, Tim Rogers, we manage a fantastic team of 45 talented developers based in Derby, UK. As well as the commercial responsibilities, I work closely with colleagues at our parent company Outplay Entertainment and with our partners around the world, as we focus on scaling our business and building the very best games we can. When we started Eight Pixels Square six years ago, the shooter genre on mobile was hugely under-represented. I got into games from playing on the Atari VCS 2600, which inspired me to learn to code and create game graphics. I had the good fortune to grow up in an era where you could make your own games on 8-bit home computers like the Commodore 64 or Sinclair Spectrum. I worked on art for several games for popular publishers while still in high school before co-founding my first games development studio in the late 1980s. My role then switched from games development to the business side of growing a successful studio. Despite not being able to see a sustainable career in video games when I was younger, I was always fascinated by them and knew that it was a career I wanted to explore. Some would say I had an unusual career path as I left school aged 16 after a trip to Tokyo to learn about development on the Nintendo Entertainment System (which shared a similar CPU to the Commodore 64). At that time there were no dedicated games courses for me to explore so I found myself learning on the job. These days there is a wide range of options to pursue all aspects of professional games development, including at the well-regarded local university in Derby. There are so many aspects that are fulfilling in my role, however I’d say the best part is being able to work as part of such an amazing team, with a great mix of talents, creativity and technical skills. Many of our team are veteran developers with decades of experience making high-quality games, which makes it possible to iterate and move quickly to meet our goals. I love that it’s such as dynamic industry, but success still usually comes down to whether a game is truly fun, compelling and able to retain players interest. The games industry is a vital part of the creative sector, an area that is growing at rapid speed, however generally speaking, many of the career opportunities are misunderstood or even unknown. This has meant that the next generation of game makers need to be actively supported, to help educate the wider public on the massive opportunity there is for a successful career in games. If you can build a portfolio of work which showcases your talent and aptitude, this will really help to differentiate yourself from other candidates. 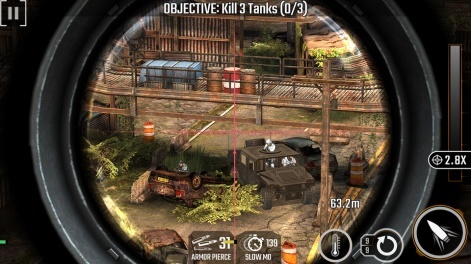 What is it about the mobile shooter genre that made you focus on it? When we started Eight Pixels Square six years ago, the shooter genre on mobile was hugely under-represented compared with longer established platforms such as console or PC. There was a clear opportunity which we could meet using our experience creating shooters on console, including on several James Bond, Duke Nukem and Dead Space games, so it was a natural fit for us to focus on the mobile shooter genre. With our title Sniper Strike, we’ve looked to create a shooter that works specifically for the mobile environment, as well as snackable play opportunities across a number of other platforms. We’ve brought our experience of triple-A console and PC game development to mobile, but with a twist that ensures the titles we create deliver a great experience in the palm of your hand. Pacing yourself is very important, including factoring in enough time for contingencies and iteration to make sure your game is successful. There are a few things I think are important to remember when you are beginning your career in video games. Extra-curricular activity is as important as the courses – if you can build a portfolio of work which showcases your talent and aptitude, this will really help to differentiate yourself from other candidates. In addition to this, building up your own network of other professionals through attending industry events where you can always keep learning will be invaluable to your career.